The newest design concept for the Clear Capital building to be erected on the corner of Airport Road and Chandelle Way. The following numbers compare costs and projections for the previously approved 10,840-square-foot office building for Clear Capital, versus the new 12,640-square-foot building. Read more: Airport board president John Jones and director Tom Van Berkem penned a My Turn column this week in response to recent rumors and criticism of taxpayer dollars being spent on a building for a private company. TRUCKEE, Calif. — The airport district is increasing its initial investment into the building that will house the Truckee branch of Clear Capital. 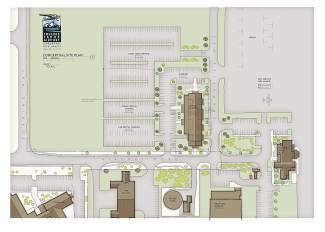 In a unanimous vote Wednesday, the Truckee Tahoe Airport District board of directors approved the allocation of $1.61 million to start work on a 12,640-square-foot building. It includes 10,840 square feet for office space for Clear Capital. The extra 1,800 square feet of space would be capable of housing two rental car companies. “It is very important for me that we do meet Clear Capital’s needs, but we are looking beyond their needs for the building,” said board vice president Lisa Wallace. While constructing a larger building to house other tenants is estimated to cost $4.1 million — up from $3.46 million for the 10,840-square-foot building directors approved two weeks ago — the rate of return to the district would be greater, according to TTAD. The district projects annual revenue from the building will increase by $171,500; the number of years to break even on its investment will decrease by a decade; and its estimated profit through 2045 will increase by $6.88 million. “It actually makes this building pencil out to look a little bit better from an investment standpoint,” said Kevin Smith, TTAD general manager. As for the rental car companies that currently operate at the airport — Hertz, Enterprise and Avis — two have expressed “strong interest” in being housed in the new building, according to a memo Smith wrote. Such a move would also resolve an need to upgrade the rental car facility, he said. At the Feb. 11 airport board meeting, a Clear Capital representative indicated the company was OK with sharing the space with rental car operators. The businesses would be separated in the building proposed on the corner of Airport Road and Chandelle Way. The board-approved $1.61 million transfer from its reserve budget will fund design, permitting and construction costs for the building up to Sept. 30. The remaining project cost — $2.48 million, also coming from reserves — is budgeted for the district’s 2015-16 fiscal year, which starts Oct. 1. The goal is to break ground by Oct. 15 and have the building read for occupation in August 2016. Last week, Clear Capital signed a construction and lease agreement with the airport district, which President Kevin Marshall said will keep 100 to 125 jobs in the area.